Wow. 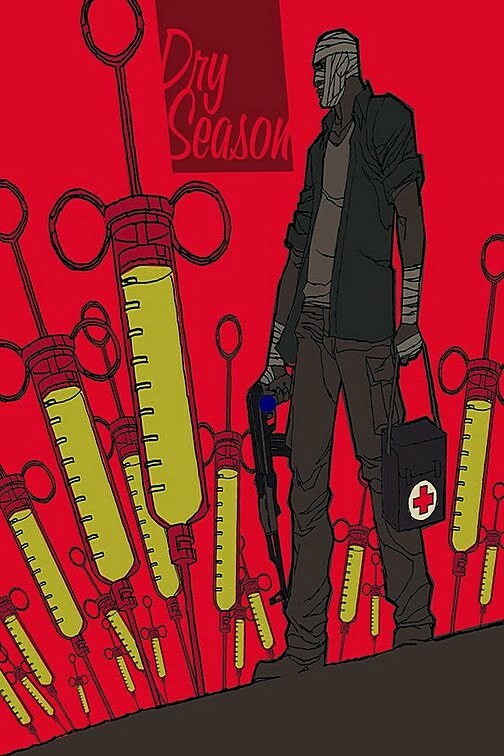 Best cover art yet for this series. Dave Johnson has produced something I would gladly hang on my wall. On the trail of Moses, his wife Sera, weary from the horror that has pervaded her life, stops to witness an Acholi wedding. Tradition and love beneath a sprawling blue sky… now she’ll have to convince herself to turn her back on a beautiful world and follow Moses into the darkness. At issue 20 already, and getting better and better. An amazing success story. 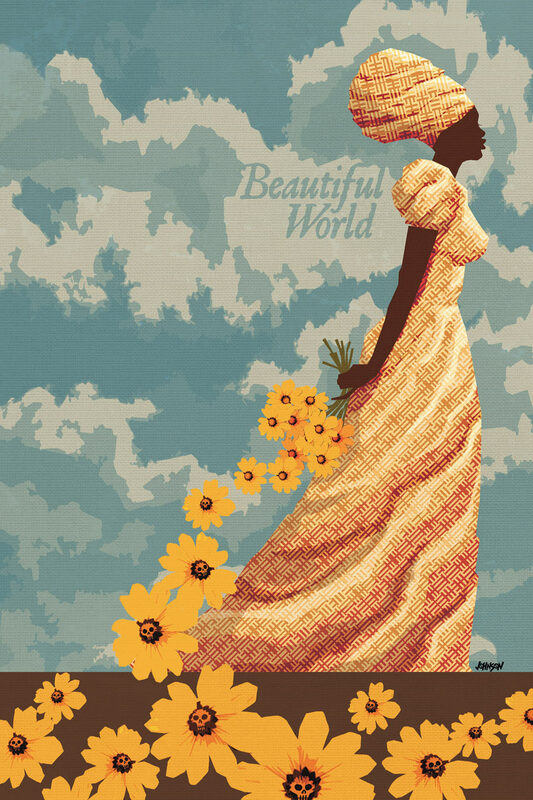 Plus, another wonderful Dave Johnson cover. 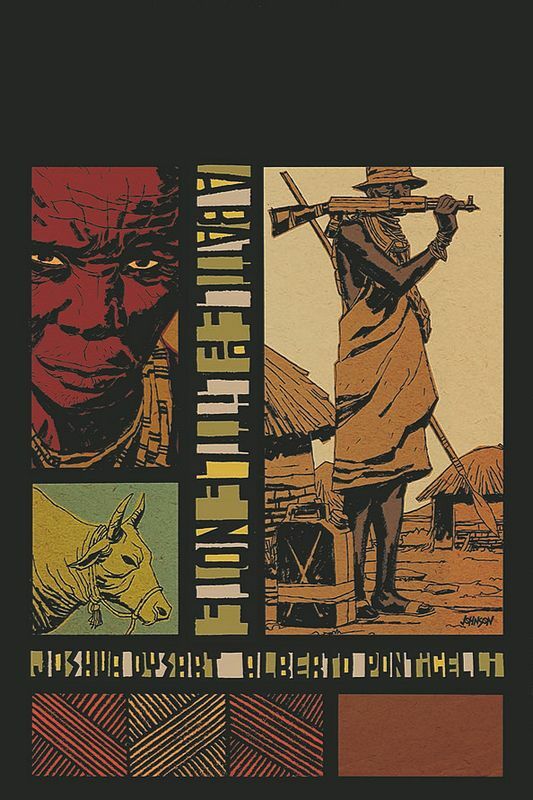 Barely clinging to sanity and hunted by Karamojong cattle raiders, Moses finds himself physically and psychologically under siege in a hidden village of the exiled and deformed – a village that may very well exist only in his mind. A new storyline! Moses has a list. 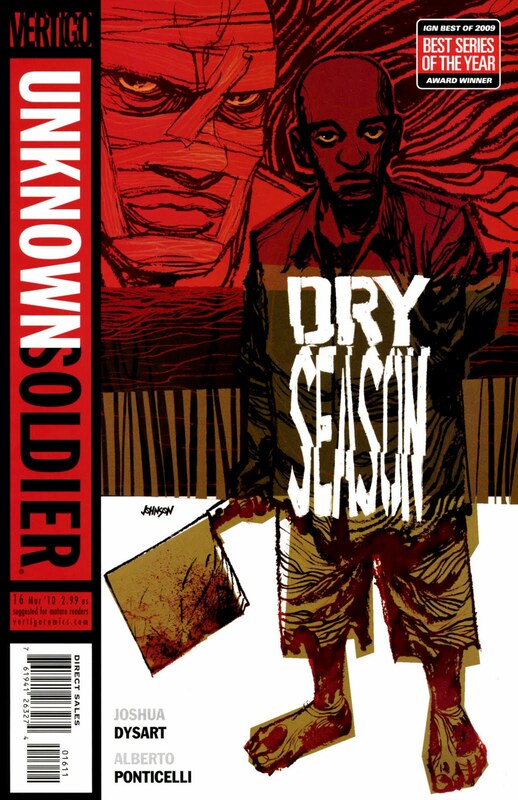 Throughout his murder investigation of the IDP camp’s doctor, he’s been deciding just who will live and who will die. Now, caught in an arms deal near the Sudan border, it’s time to start checking names. 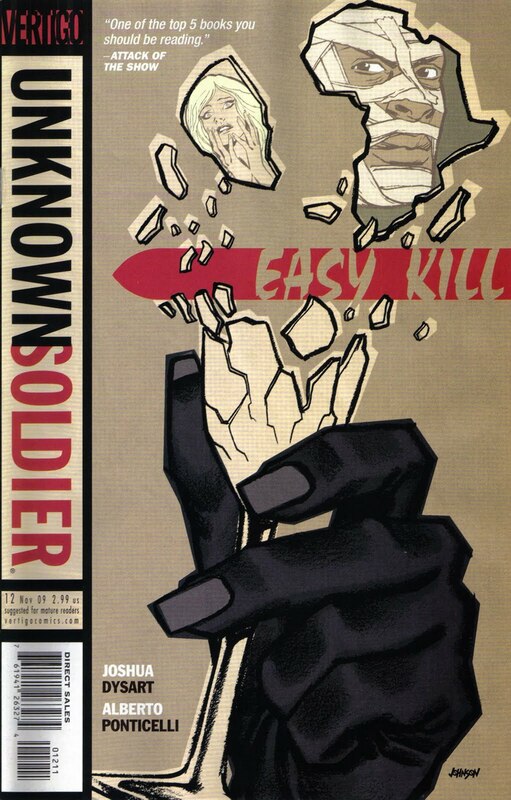 But this is one battle that’s not as simple as it seems. 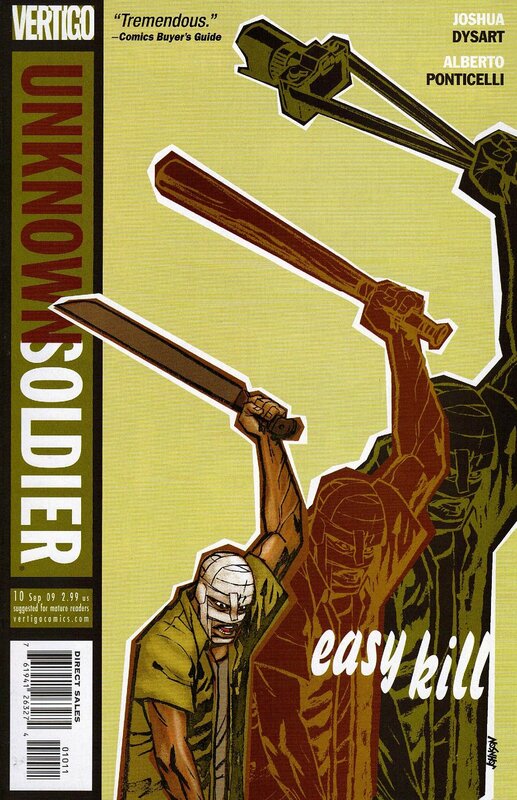 Deservedly voted as best new series of 2009 by IGN, Unknown Soldier #16 is another faultless example of how to craft a gripping, intelligent comic book that does not rely on the familiar props and plots to pull in a crowd. This title treads its own distinctive path, and now, in its mid-teens, it makes me wonder how long it will be before some other titles will seek to emulate this critically acclaimed work.
. However, it is an exchange with the UDPF captain midway through this issue that provides the strongest scene – the rationale of child killing in a war torn region laid bare. Moses can barely suppress his rage. 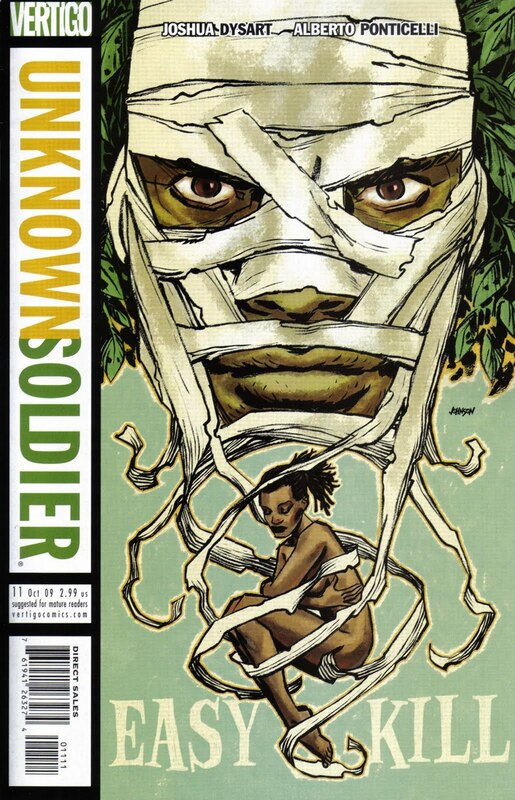 There is much more going on in this issue – Moses shows the other side of his nature as he (by necessity) returns to his profession as a Doctor to try and help the sick in the camp. There is a long, hard look at death, disease and suffering – Ponticelli’s pencils never shying away from the reality of the horror of it all. Joshua Dysart continues to script this story with an intensity, intelligence and fury that, for a first time reader, will astound you. 16 issues in, I can feel the intensity shimmer off the page. An absolutely essential comic book. 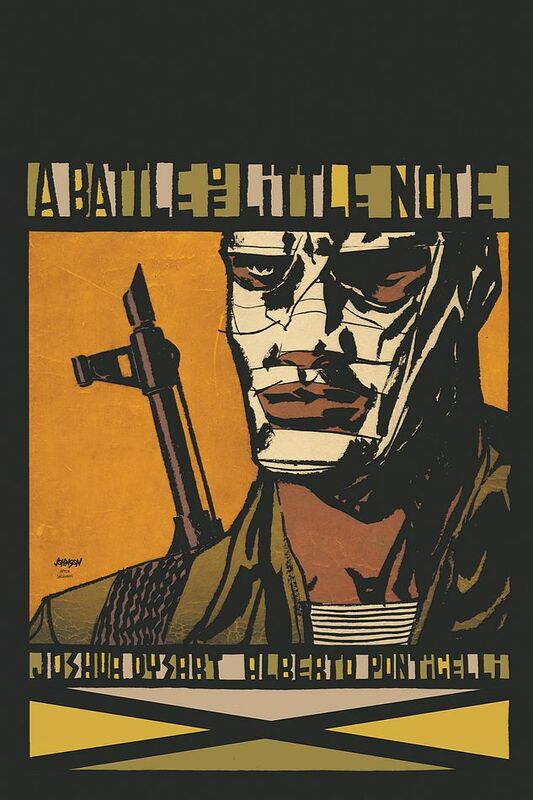 An utterly compelling comic book. There is little doubt in my mind that this title will go down as an all time classic, and month by month its stature grows. 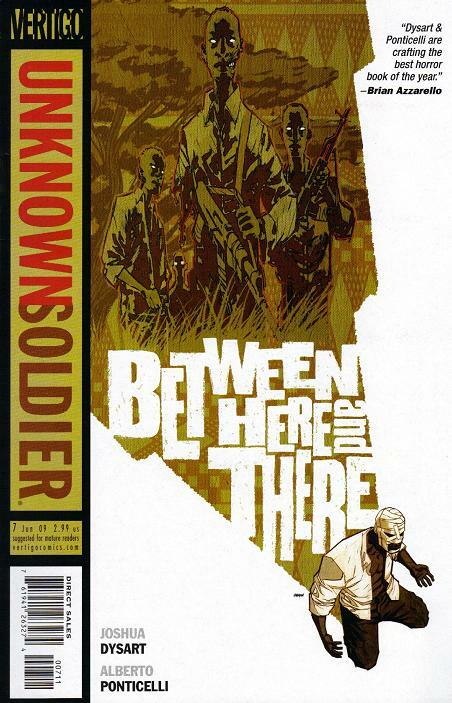 Set in and around war-torn Uganda in the early 90s, the ‘Unknown Soldier’ of the title is Dr Moses Lwanga, a pacifist who, having seen so much horror, becomes quickly embroiled in conflict. 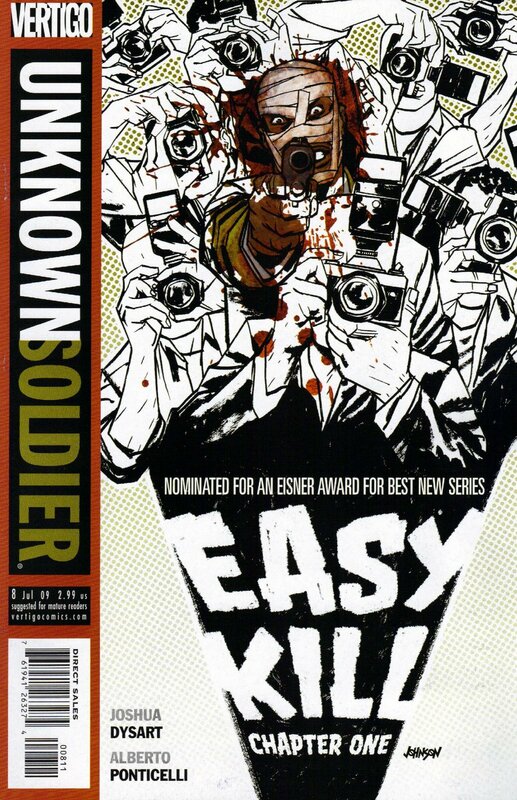 The main arc this year, ‘Easy Kill’, had a controversial, contemporary storyline – the potential assassination of a Hollywood actress in Africa on a Goodwill visit – and a cinematic vision that delivered this tense, gripping tale. 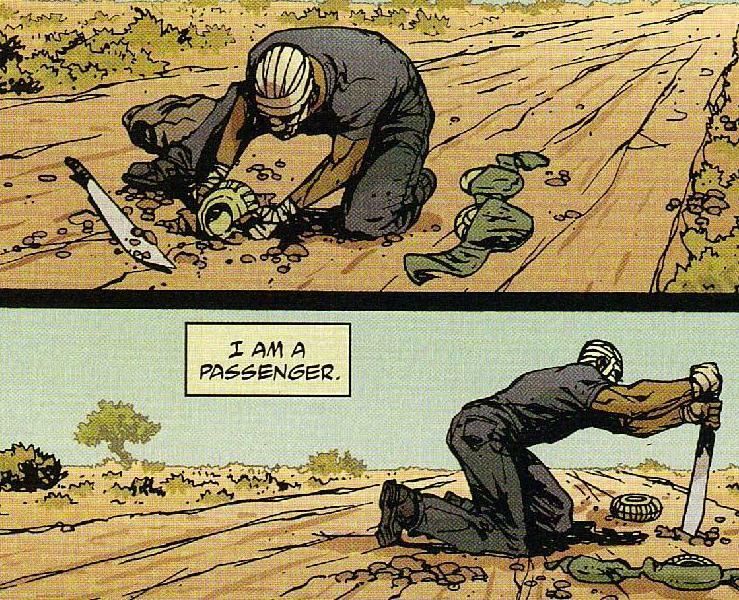 The writing and art are exemplary, and I have, on a few occasions, urged people to get into this comic book, as I believe most people who enjoy comics would get something out of this. It is a superior title, an intelligent, thought-provoking, challenging work. 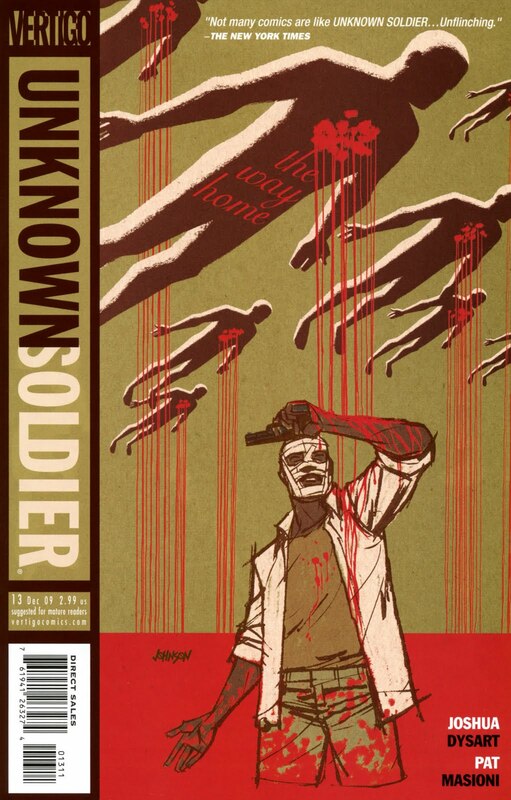 I will let the wonderful cover art and my reviews (linked at the bottom) of this years Unknown Soldiers do the rest. A highlight of the year and (no doubt) a highlight of next year. The harsh reality of the camp is portrayed unflinchingly in this issue, where reality hits hard, but suspicion can be rooted in magic and witchcraft. Ponticellis art is exquisite – each panel is like a painting, each panel beautiful but that beauty never detracts from the powerful subject matter being displayed. 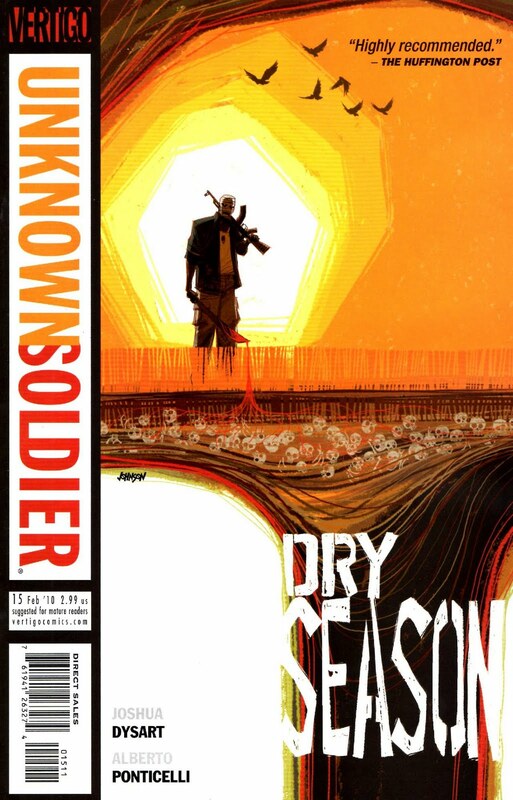 Dysarts plot centres around missing medicinal supplies, a Doctor struggling to cope and suspicious of Moses and his new path of redemption, and the UPDF, trying to stem the tide of LRA attacks, but seen as little more than Mercenaries by some. And then there is Moses, struggling for a reason to justify staying in the camp – and then, right at the end, a reason turns up…. Plus! Jack Lee Howl makes an appearance, a real cherry on top kind of moment in another superb issue. 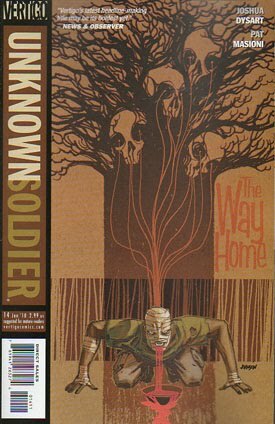 When I read ‘Unknown Soldier’, it is so obvious that Dysart and Ponticelli do not ‘produce’ a ‘comic book’ tile – they pour energy, care, concern, vigour, love and anger into this important work. More and more vital as time passes, the passion and anger in this title rise and become more coherent as each month passes. The world is becoming as hot as the barrel of a spent gun, and Moses feels it most of all. Now he’s making a mad play, falsely aligning himself with everyone in hopes of figuring out who killed the camp doctor before one of his new “friends” puts a bullet in his back.